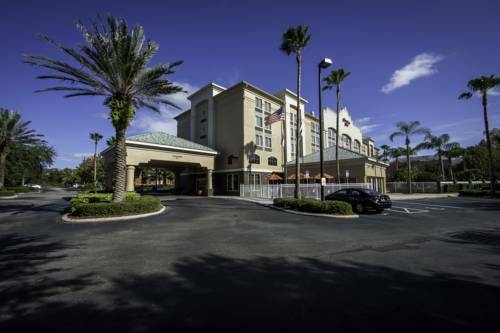 Hampton Inn Orlando/Lake Buena Vista hotel is located in Orlando Florida just 1 mile from Walt Disney World Resort area and easily accessible from I-4. Our Florida hotel is 15 miles from the Orlando International Airport and a short drive to championship golf courses and Church Street Station. Other area attractions include the Walter Disney World Resort Universal Orlando water parks Old Town and Sea World Adventure Park. Within .5 mile of Hampton Inn Orlando/Lake Buena Vista hotel of Florida you can dine at over 10 restaurants. Hampton Inn Orlando/Lake Buena Vista hotel of Florida features 147 hotel rooms a guest services desk in the lobby exercise gym and outdoor hotel pool. Amenities at Hampton Inn Orlando/Lake Buena Vista hotel include complimentary hot breakfast in-room coffeemaker full size iron and ironing board and TV with cable HBO CNN and ESPN. We also offer connecting hotel rooms cribs and hair dryers. We love having you here at the Hampton Inn Orlando/Lake Buena Vista hotel in Florida. all reservations must be guaranteed with major credit card or advance cash deposit to hotel regardless of time of arrival. all reservations must be cancelled 24 hours prior host time unless deposit required. Policy subject to change. - Offices of Reedy Creek Adm.